Although I spend much of my time, at the moment, studying First World War soldiers sometimes I come across a story so good that I have to do a little extra research and then pass it on to you. You may find it interesting, it may inspire you to do some research of your own in a similar area, but whatever the outcome I can assure you that find these 'side' stories great fun to write. 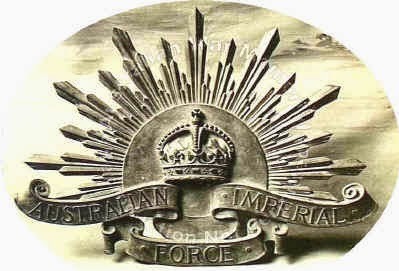 A few days ago the Australian Imperial Force seed data was added to Lives of the First World War. I am a member of a Facebook group for 'Community Curators', in other words a bunch of us who spend far too much time on LFWW can now chat and share moans and helpful hints about our favourite(!) website. LFWW don't seem to officially notify their customers when a new record set is added but between us someone usually notices. We have been waiting for Australia records for a long time - many young working class men left Britain in the decade before the First World War for a 'better life' in Canada or Australia, but when the war started they signed up to serve their home country. If they fell, and so many did, their families chose to remember them on memorials in their home towns, I would estimate that each Barnsley memorial has one or two of these Commonwealth men listed. I am researching the war memorial at St Luke's, Worsbro' Common in depth and if you follow that link you will see a photo and full transcription of the names, there is also a link to my LFWW Community for the men of the area. Worsborough Common (the spelling varies and the abbreviated version is often used) is close to where we used to live on the edge of Barnsley town centre and there was the chance that some of the OH's relatives would appear on it or be connected to it as a large branch of his family tree passes through the area in the nineteenth and early twentieth centuries. William Malkin is the man named on this memorial whom I had flagged up as serving in the Australian forces; his family had lived in Ward Green, Worsborough Bridge for several generations and on the 1901 census he is living with his parents, William and Hannah, and he gives his occupation as Pony Driver Pit. He was 17 years of age, therefore born in 1884. His father was also a Coal Miner. William was killed in Belgium on 28 September 1916. The additional information on his Commonwealth War Graves Commission entry states that he was the, 'Husband of Frances Mary Jeffs (Formerly Malkin), of 27, Caxton St., Barnsley, England. Native of Worsborough, Yorks, England.' Yet once I began to investigate the records linked by LFWW things began to become a little bit mysterious. LFWW have used data from the National Archives of Australia and in particular a site called Discovering Anzacs. The full service records for the soldiers are available to view, similar to the ones we see here on Ancestry for British soldiers, but in this case completely free! A link on William Malkin's Life Story on LFWW took me directly to his records where there were twenty nine pages to read! William Malkin enlisted in New South Wales in August 1915 giving his occupation as Miner and his age as either 25 or 35 on two separate copies of his attestation form (I suppose one of these could be a clerical error) neither of which agree with his known age from the census and naming his mother Hannah Malkin of Ward Green, Barnsley as his next of kin. I found this odd considering the additional information on his CWGC entry, but then I found several letters referring to his wife. It seemed that she had got in touch with the Australian authorities in August 1916 claiming to be William's next of kin, but that she had not supplied any documentary evidence - her marriage lines are mentioned - to support her claim. One letter notes that, "she states they have corresponded recently, and quotes his regimental description". The authorities appear to accept her claim despite a discrepancy in "her description of the man ... [and] a difference of six years [in his age]." Why did William lie about his age - was he trying to appear younger so that he could sign up, if the age of 25 years and 5 months given on one form is correct? Why does he not mention that he is married? He specifically answers the question about marriage in the negative! Sadly William was killed in September 1916 and is buried in the Railway Dugouts Burial Ground near Ypres in Belgium. His obituary in the Barnsley Chronicle mentions that he emigrated to Australia 'about seven years ago' - so in 1909 then - and notes his mother's name and address. It does give a separate address for William, which may be a clue! I decided to try to find out more about Frances Mary Malkin (later Jeffs) to see if I could work out if indeed they were married, if so why did he leave her and go to Australia, when did she remarry, did she have any children and what happened to her after the war. I find the stories of the women left behind in Barnsley (well anywhere I suppose) even more fascinating than the military history of the war itself. There is very little written about how women coped without their menfolk and what strategies they used to cope during the difficult and stressful war years. What I found was quite surprising ... but this post is long enough - I'll tell you more in my next! Thanks for reading. Interesting to note that when young William signed up for service he listed himself as single and his next of kin his mother Hannah.